For Christmas Santa bought me some fabulous ink! (Well . . . actually, I ordered the ink and Santa wrapped it, but whatever). I asked for several Japanese inks. One was Kobe’s Mikage Grey (which I included in a review of grey inks here). 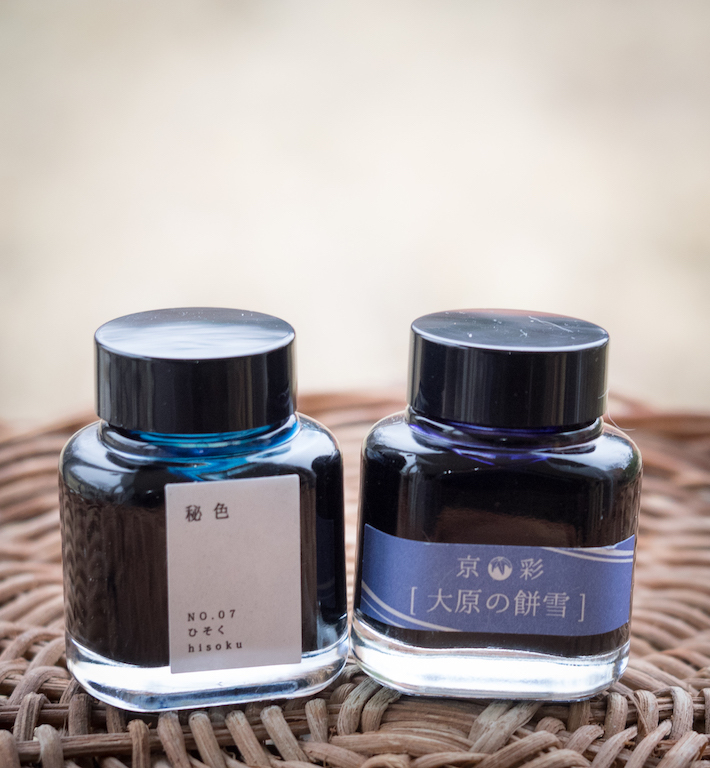 The others were Kyoto TAG inks: Kyo-no-oto Hisoku, which is a limited edition ink, and Kyo-iro Ohara’s Morning Snow. These are inks produced by the TAG stationery store in Kyoto, Japan. I fell in love with Kyo-iro Ohara’s Morning Snow when I first saw it on the Vanness website. The name comes from the soft purple shadows that appear in snow drifts on cold mornings (not that we have such days in Abilene, Texas, sigh). The color is a muted purple that can be quite dark in wide or flexible nibs and nicely subtle in finer ones. I tested the ink using my Aurora Nebulosa with a medium italic nib (no flex). The ink shades well and writes beautifully, though it is a bit on the dry side. 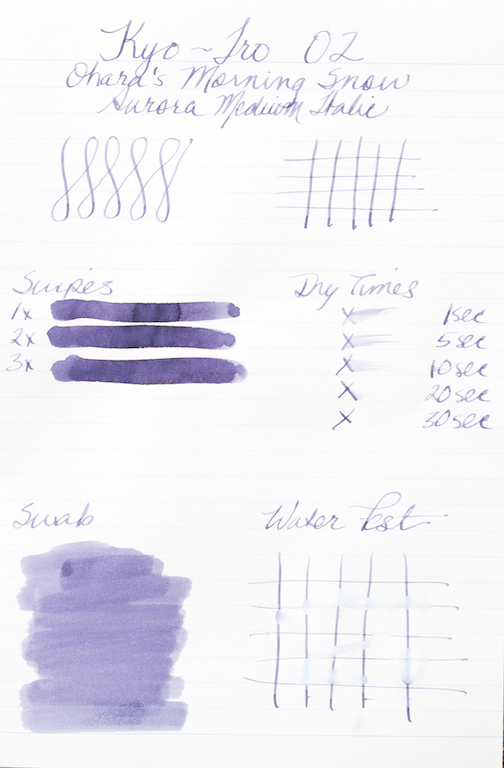 As you can see from the swipes, the ink can appear as a dark purple or (as in the swab) a dusky purple. It is not waterproof. Chromatography reveals several colors in Ohara’s Morning Snow: dark blue, purple, lavender, pink, and light blue. The ink exhibits wonderful shading and sheen in wide nibs, as demonstrated using my Handwritmic Ruling Pen. But for normal writing, the ink is much more subtle, as you can see in these writing samples with my medium italic nib. The poem is by Christian Wiman who teaches at Yale. I saw a swatch of Kyo-no-oto Hisoku on the Fountain Pen Network and went nuts over it. Poor Lisa at Vanness Pens got about a dozen emails from me about this ink. Fortunately, she was able to procure a bottle and got it to me in time for Christmas. 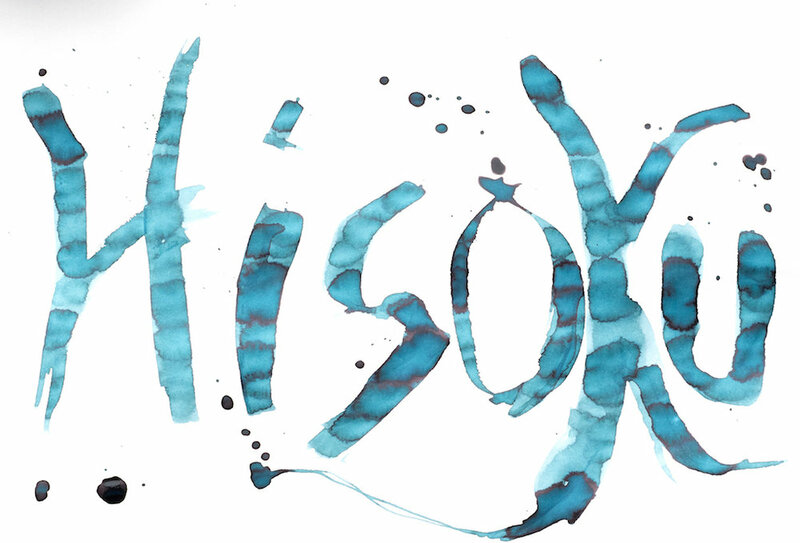 Hisoku means “secret,” and this ink looks like something whispered in the wind. Unfortunately, it is a limited edition. Hisoku is an unusal color. It’s not bright like a teal ink and it’s not dark like a blue ink. Vanness calls it a “steel blue.” I think it looks like the muted blues you sometimes see in Renaissance paintings. I tested it using an Omas fine extra flessibile nib. It exhibits gorgeous shading and the color is quite unique. It reminds me a little of Noodler’s Dostoevsky, but I like Hisoku better. The ink is wet and is not waterproof. Chromatography reveals some of Hisoku’s secrets. It is a muted blue ink with some yellow tones. Hisoku looks fantastic in a wide nib with excellent shading and sheen where the ink pools. 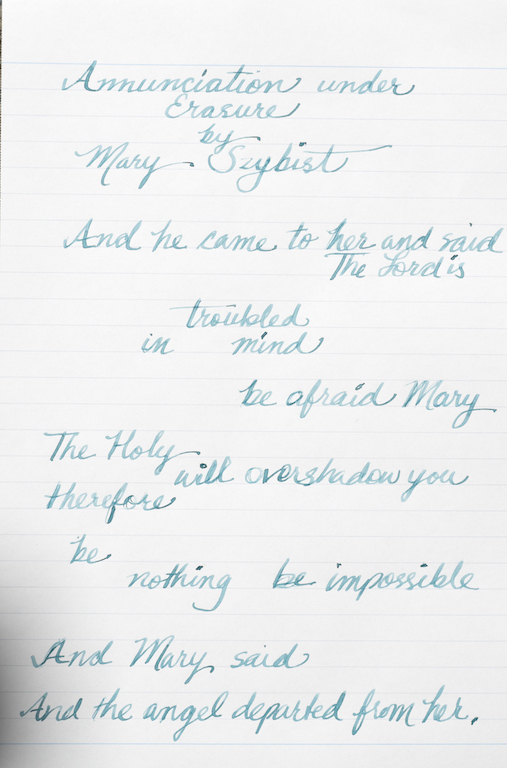 I wrote out a poem by one of my favorite poets (Mary Szybist) using my Omas pen, but something is wrong with the feed and the nib kept railroading. So, I switched to my TWSBI mini with a 1.1mm stub. The ink performed well. It’s wet, but not deeply saturated, yet it shades beautifully. I love Kyoto inks because they are soft, distinctive colors that evoke emotions in me that other inks simply do not. I can’t explain this. Perhaps the names of the inks create images in my mind that stimulate emotions. Perhaps the colors themselves remind me of fond memories. Either way, the inks are special to me. Posted on December 29, 2017 by Susan Pigott and filed under Kyoto, Ink Reviews, Tag.